Survey and polling tools are often used in marketing or politics to assess ratings for certain services or products. Polling tools can take many forms, some just use a simple dichotomous scale of Yes and No, or a more complex Likert Scale that consists of three or more choices. 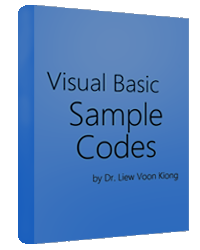 You can create Polling tool in Visual Basic easily by using the option buttons. In our program, the users are given five choices, Excellent, Very Good, Good, Satisfactory and Bad.The results are presented in frequency and percentage respectively. where (x1,y1) is the coordinates of the upper left corner of the bar and (x2,y2) is the coordinates of the lower right corner of the bar. To show the bar length according to the percentage, we can use certain value to multiply the decimal value of each score and put it under x2. Finally, we can use the Picture1.Cls method to clear the picture box in order to refresh the drawing.